We had been talking with Joë Layno at Shimano for quite some time about doing an in-depth review of Shimano's flagship electronic Dura Ace drivetrain system, designated Di2. The system is not that new anymore, having been ridden for a few seasons now by the pro peloton, so we know it works, and our interest was to try something a little different. Cyclo-cross racers have been discussing at length the potentially huge benefits the system would offer to them, and a few top pros have raced it, but there has been no real test to-date of how Di2 would stand up to both the rigours of 'Cross racing and the muck and cold that Canadian riders face for a good third of their year. Shimano is by no means the first to come up with the idea of electronic shifting, or even to produce an electronic system - I had the opportunity to install and ride with the Mavic Mektronic system more than 10 years ago. Mektronic encapsulated all of the issues that have plagued electronic shifting systems - finicky, fragile (you couldn't even look at the rear derailleur, or it would go out of adjustment), poor battery life, slow shifting and pricey. Di2 was designed to address all of those issues - well, maybe not price ... although that may also change in the near future. At its heart, the Di2 system consists of front and rear derailleurs, shift levers, wiring and battery system. There is an optional remote shifter two-button system for the rear derailleur which can be mounted on the top of the handlebars (near the stem). The Di2 system uses small motors in the front and rear derailleurs to precisely move the chain the correct amount to shift from one cog to the next one. The key word here is precisely - there are no changes in cable tension or amount of pressure applied to mess up a shift. Each shift has exactly the correct amount of pressure applied, and the rear pulleys or front derailleur move the chain as much as is required. The rear derailleur even applies a brief overshift to push the chain over before automatically correcting. Now, a competent and skilled rider can accomplish the same task, but can they do it on every shift, no matter the circumstances? Di2 can, promises Shimano. 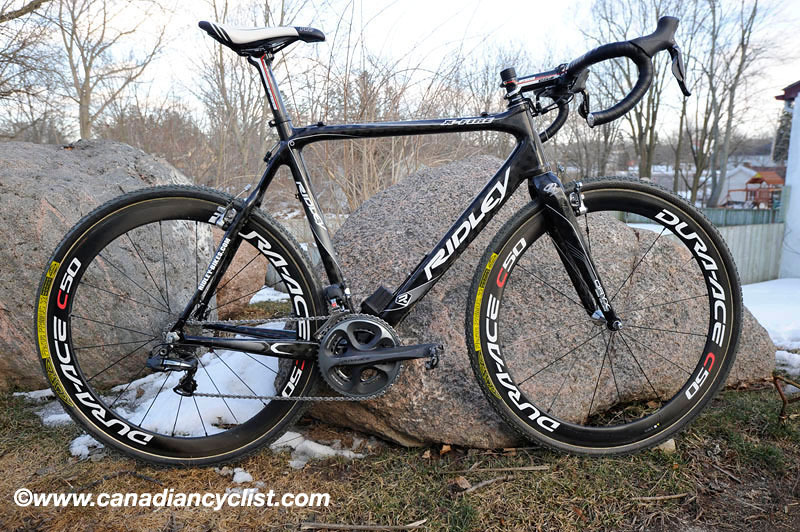 For our test, Ridley, through their Canadian distributor Norco, supplied the X-Fire carbon frame and fork, while Shimano provided the rest of the build. The X-Fire is is a full carbon frameset, the second from the top model from the largest bike manufacturer in Belgium - the heartland of cyclo-cross. Ridley provided the frames used by the two-time world champion Zdenek Stybar on the Telenet-Fidea squad, as well as the Vacansoleil ProTeam of Belgian road champion Stijn Devolder. Shimano Canada provided the full Dura Ace Di2 group, a pair of carbon C50 wheels and assorted other components from their Pro line. Final bike total weight was an impressive 17.5 pounds [7.94 kg] for a 56 cm size. The full cost for bike as spec'd was just under $8000; certainly a significant amount of cash. However, the exotic C50 wheels took up over a third of that ($2800), so $1000+ could quickly be shaved off the cost. The bike was built up by Canadian pro mechanic Chad Grochowina, who wrenches with Steve Bauer's SpiderTech p/b C10 Pro Continental squad, and regularly works with the Canadian national team. 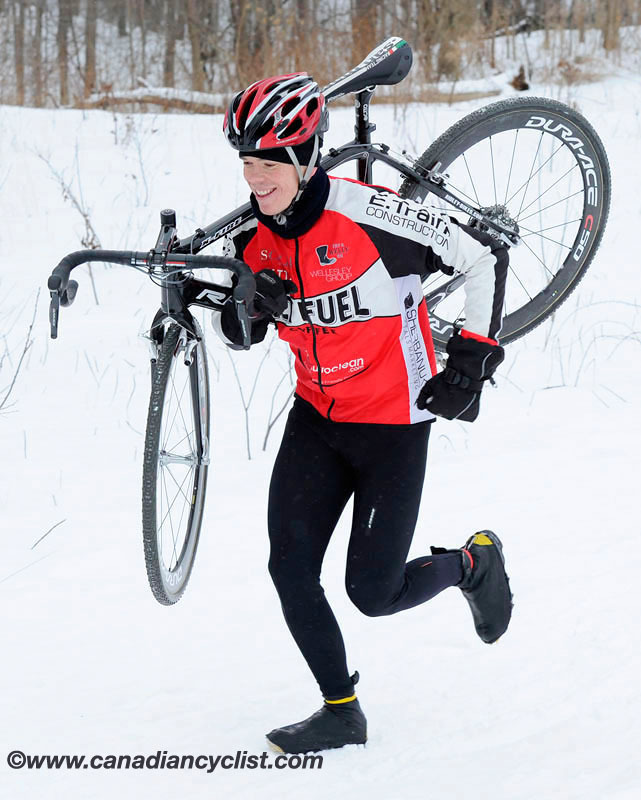 Our test rider was Peter Morse - one of Canada's top cyclo-cross racers, and a former national team member, who races with the JetFuel Coffee team out of Toronto. • Would the adhesive holding on the externally routed wiring ['cross manufacturers do not currently offer an internal option for Di2] peel off in muddy, coldand wet conditions cyclo-crossers face, especially when grabbing the downtube for shoulder carries? • Would the battery continue to work in the cold, and stay on the bike under rough usage? • How would shifting work with gloves? • Would the shifting be fast enough, work in the rough conditions of cyclo-cross? As far as the Di2 stuff is concerned, it installs quiet easily and is simple to set up. It's fairly straightforward if the instructions are followed exactly. I will also add that if it's being used in wet and muddy conditions it would be best to seal all the connections with heat-shrink tubing to keep the moisture out. I've seen a few bikes over here react poorly to the wet (pretty isolated cases but relevant none-the-less). Below are Peter's testing observations on Di2, along with (in red) the responses from Shimano's Joë Layno. The Ridley X-Fire observations follow after. • Brakes very powerful, but need carbon pads for use with the all-carbon C50's. I replaced the "severe condition" Shimano pads with non-abrasive Yokozuna salmon pads, which worked very well. Joë Layno noted that Shimano does not make a cross-specific pad at this time. • The Dura Ace C50 wheels were well suited to deeper snow. The high rim profile cut through snow and acted like a rudder while not getting bogged down by snow going around the spokes. Might work well in mud too for the same reasons. • The 34-50 tooth front chain ring combo had too much gear difference at 16 teeth. 50 teeth is too big for cross racing, but would be well suited to a race like Paris-Ancaster or road riding. I didn't have a 44 or 46 compact ring to test, but some pro crossers in Europe have been using such rings with this system. Joë Layno noted that the European pros are using some custom rings that Shimano has developed for them. At this time, Shimano does not have a 40-46 compact, but a 39-46 is available. • I tried my best to drop the chain off the inner ring but could not. Up shifts were predictable and swift, though lacked the direct feel of a cable. You just needed to press the button and trust that the chain would shift, which it did well every time. • The front derailleur trimmed itself automatically when needed. I cross-geared the chain on purpose, (big-ring to big-cog). This is common practice in CX, and there were no problems with Di2. • The remote shifter mounted on the top of the bar was welcomed for the rear derailleur, maybe a front would be good too. The buttons were a bit too close together for my thick gloves which made it harder to press the correct one. The down shift was on the outside button and the up shift was on the inside button nearest the stem. I think they should be reversed so it's more natural which button to press. Joë Layno noted that a good option might be the sprinter single button shifters. • Rear shifting was perfect every time. Downshifting required multiple taps of the small button on the brake lever. Shifting was instantaneous with no lag or delay between taps, but I missed the multiple gears accessed by a single swing of the hand. Up shifting felt like the other systems but was smoother. The chain never rubbed or made unwanted shifting sounds during my test-rides. • Brake/shift levers felt large enough and were comfortable like the 7900's. • The buttons on the shifters take getting used to, but were pretty intuitive to use and compared ergonomically to other Shimano shifting systems. The buttons are in roughly the same location as the cable actuated shifter. The brake lever is fixed so you just tap the button on the lever blade instead of swinging it for an up shift. • The battery did not lose performance. I did not charge it once. I did not clean the bike with water or ride in really wet conditions. I could not get it to rattle or bounce off. It was solidly in place yet could be easily and quickly removed. Joë Layno noted that the battery is designed to last for an entire Tour de France [ie, number of shifts] without needing a recharge. He also pointed out that the system was designed to withstand the pressure washers that pro mechanics use on a daily basis. • The rear derailleur wire was taped along the down tube. The tape was coming loose. Under wet conditions that would be a big problem. Grabbing the down tube for carrying/lifting in races and repeated washing would exasperate this. Joë Layno noted that this would not be a concern on a Di2-specific frame, and that the wiring could potentially be run in a different manner for cyclo-cross. • Electric shifting has the potential to be great for cross, and road for that matter. The lack of maintenance would be an asset. Traditional cables can deteriorate quickly; they can be ruined in a single muddy CX race. • Price is the main deterrent right now. The performance is so much better than the new systems that run all cables under the bar tape. The lack of shift quality on those is due to the cable friction created by the cable bend at the levers necessary to route them under the bar-tape. Electric systems eliminate that and makes the whole system cleaner, no oil or grease, no cleaning or replacing worn cables. Routing through the frame makes it even nicer. Joë Layno was asked about the ongoing rumours that a lower priced [Ultegra] Di2 group was on the way. All he would say was a non-committal "the possibility of a lower level would be good". The geometry was the most noticeable benefit. The X-Fire has a higher bottom bracket than many 'cross frames. Benefits to this include easier pedalling through corners with less chance of scraping a pedal on the ground. 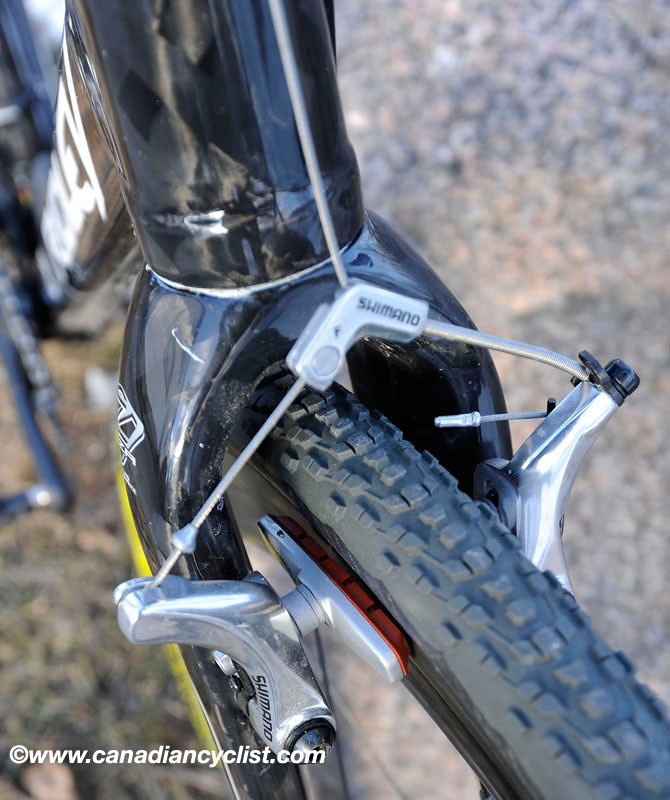 Also, the high BB helps keep the cranks and pedals above deep mud and sand, where a cross bike finds itself sinking in. This allows pedalling further when riding through soft ground. Low pressure tires also lower a bike, so a higher BB offsets this. Another benefit of this frame are the short chainstays. Coupled with the short top-tube, these features allow tight cornering and easy riding in technical sections. The frame had a high top-tube, this helps with shouldering the bike since you can easily get your arm through the main triangle and under the downtube. The weight and comfort of the frame was appreciated. The all carbon fibre frame was noticeably lighter than aluminium frames, and the lack of weight was felt when riding and lifting to portage. This definitely will save some of a riders energy over the length of a cyclocross race. Riding the bike was comfortable, not harsh but still very stiff. The front brake and fork combo did not cause chatter or squealing, though for heavier riders or when using certain brake pads/rims this could change. I used carbon rims and carbon specific pads these are not as grabby so don't squeal as much. I didn't ride it in the mud but I can tell that tire clearance was very good front and rear. This is the best cross frame I've ridden so far.